Welcome to the first installment of our Mass Effect: Andromeda Game In Progress review. Gameological editor Matt Gerardi will be playing through this latest entry in BioWare’s beloved space-opera series and occasionally reporting back with his thoughts on how it’s shaping up. This first entry covers his first 20 hours with the game, at a point where he’s explored Eos, Havarl, and Voeld. Matt is playing as a woman and, for simplicity’s sake, will be referring to Ryder as she/her throughout. As always, we invite you to play and comment along as he pathfinds his way through the Heleus Cluster. The first 10 hours of Mass Effect: Andromeda have been available to the public since last week, and the reaction has not been kind. Gaming sites and social networks were flooded with footage of its awkward conversations and animation. For a few days, the game became a laughing stock as those bits were torn out of context and bandied about. Frankly, there’s no context in which the rubbery jowls of the emotionless automatons Andromeda has you talking to wouldn’t be funny, and there’s plenty more to gawk at. The game is filled with cringe-worthy dialogue, poorly edited conversation scenes, and bizarre harmless glitches. At times, it feels like the whole thing is barely being held together. It’s hard to believe a blockbuster game from a series this beloved would be released in this state today, even if it is the debut project from an untested team. Those surface-level hiccups don’t disappear after the first 10 hours. If anything, once you’re over the initial shock, they become one of the game’s greater joys. Andromeda is without a doubt the schlockiest of Mass Effects, with a plot and script that feel borrowed from the first season of a straight-to-DVD Asylum-produced Star Trek knockoff. In that light, the quirks are right at home. If it weren’t for the spectacular environments of the undiscovered planets you and your crew will be exploring, you could conceivably describe Andromeda as a faithful ode to campy low-budget sci-fi films. Once you’re done with the game’s whiz-bang prologue and the tutorial on the first planet, the relentlessly boring desert world of Eos, you’re finally cut loose and Andromeda’s breezy sci-fi adventure starts to take shape. That’s also when the game’s deeper issues, ones that aren’t so easily displayed in an amusing 60-second YouTube video, begin threatening to slow you down. Mass Effect: Andromeda’s premise is both a blessing and a curse. You play as one of the Ryder twins. You were among the humans and aliens who fled the Milky Way during the events of the original trilogy and wake up 600 years later in the Andromeda galaxy, where you’re part of an initiative that’s looking to set up new home planets for the other travelers, most of whom are still frozen in cryo-sleep until you, the special few, get things up and running. It’s a story built entirely on hope, and that brightness shows through in the game’s lighter tone. It also provides a compelling common backstory point for most of the characters you meet. Everyone here is an immigrant who gave up everything they’ve ever known—quite literally—to put their lives on hold for 600 years and wake up 2.5 million light-years away. Some brought family along and are stuck aging and living while bureaucrats get around to thawing them out; others were willing to leave their loved ones behind; others believed they had nothing left. Either way, they’re all here, staking their claim on planets we hardly know anything about. It also gives the game an excuse to let Ryder and her compatriots loose on a bunch of heavenly bodies, all with distinct biomes and many of which are almost entirely uninhabited. (I say “almost” because the local evil species, known as the Kett, has already set up camp pretty much everywhere. Players do need people to shoot, after all.) Most of the time your ultimate goal is to make the planet livable, which requires rebooting some technology left behind by a super-advanced species that is nowhere to be found, and start up a settlement. (Said rebooting often involves, no kidding, literal space sudoku.) You’ll also come across other storylines that are necessary to move the plot forward, but mostly you’ll find “tasks.” No, I’m not just using that word facetiously to describe boring open-world side quests. The game is actually bold enough to call its endless cascade of meaningless run-here-collect-that filler what it is: “tasks.” And if you’re the kind of player who’s diligent about talking to most of the people you come across, you’re going to be up to your eyeballs in them. Tasks are the single greatest threat to one’s enjoyment of Mass Effect: Andromeda. They’re so numerous and boring that I’ve taken to ignoring them completely. Before I had brushed my completist tendencies aside, my visits to the Nexus, the new game’s version of the Citadel, had devolved into an hour spent chasing after icons on my compass, darting from one lifeless quest giver to the next. It wasn’t until I recognized that these “tasks” weren’t worth bothering with and subsequently started skipping over a huge portion of the game that I found a way to actually have some fun with it. And after 22 hours of playtime, I’m not seeing much consequence for shirking these duties. The game doles out experience points hand over fist, so you’re not losing out by sticking to the more important stuff. Similarly, the game gets immediately better once you’re able to start ignoring your first party members. The two humans you’re stuck with during the game’s earliest stages are so bland in both personality and appearance that I didn’t even consider they’d be going on missions with me. I thought they’d hang out back on my ship, doing the dirty work Shepard left for the likes of Mess Sergeant Gardner and Dr. Chakwas. But no, you’re stuck listening to a dude say things like “I think I really pissed that one off…maybe because I shot him in the face” until better friends show up. Luckily, that doesn’t take long. You’ll meet Vetra, a Turian woman with all the grit and charm of Garrus, early on and Peebee, an eccentric Asari archaeologist, not too long after that. The rest of your crew shows up in short order, but those two stand out as the game’s greatest achievements so far. They’re characters I actually like having around, and for what it’s worth, their faces are animated far better than any of the robotic-looking humans. They also have outstanding chemistry together, with Vetra being a gruff older sister who raised her sibling once their parents were out of the picture and Peebee being a wild younger sister who’s still dealing with an overbearing sibling. While driving them around in my space car, I was privy to their ongoing conversations about sisterhood, which involve all the chiding and apologizing that naturally occur when two opposing perspectives collide. Forget the cheesy space-opera theatrics. That was the most engrossing scene Andromeda has managed to offer so far. 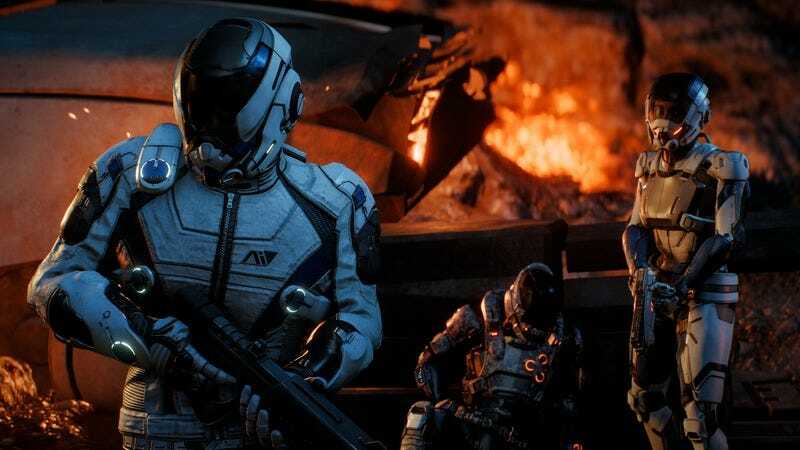 All of this is to say it feels like BioWare Montreal focused more of its efforts on filling Andromeda with stuff to do and making the part where you shoot things more fun than it did making the time players spend in Heleus feel meaningful. There certainly is a lot to do, most of it tedious and better left undone, and the firefights certainly are more fun, as Ryder is able to jump and dash around the game’s open battlefields in ways Cmdr. Shepard never even imagined. Everything else seems to have fallen backward. Taken on its own terms, Andromeda has so far proven that it can be a comfortingly swift, wispy sci-fi story that takes you to some exceptionally beautiful places. All those warts we were laughing at last week add to its B-tier charm in a way, but it’s been a hassle to find that pleasant center among the game’s astronomical bloat. And don’t even get me started on the crafting. Purchase Mass Effect: Andromeda here, which helps support The A.V. Club.